Ben j’ai le droit quoi! Just because I never get tired of strawberries! And I think I am not alone! See what Fanny did here. If you will excuse me, I have something to do! you with the strawberries again! haha! cannot WAIT to see what you come up with next! Ca valait le coup! biz’! After reading your piece on ‘Lorraine’ last week and seeing your strawberry photo , it inspired me to write about ‘Les Fraises de Plougastel’ on ‘Serge the Concierge’. Did not get to many people reading but got me to reminisce. Hi Bea, thanx for the mention. Mais je pense que c’est ta faute: tous ces posts sublimes sur les fraises (non non je n’ai pas oublié la photo du ‘cheater strawberry icecream’ (bon je sais plus exactement le titre, mais je suis sure que tu vois de quelle photo je parle. By the way, lovely pic: i love the pattern on the background. So beautiful!!! merci de ne “jamais te lasser des fraises” … comme ça nous profitons d’une photo magnifique … de fraises … mûres et … sucrées … et juteuses … et fondantes ! Hi iamchanelle, ahah you are right, I am strawberry obsessed!Hi iamchanelle, ahah you are right, I am strawberry obsessed! Salwa, oui vive les fraises! Thanks Serge, I will go and get your post! I love this variety a lot! Hi Fanny, ahah merci! I guess I really srawberries and it shows. My favorites of all are wild ones found in forests! 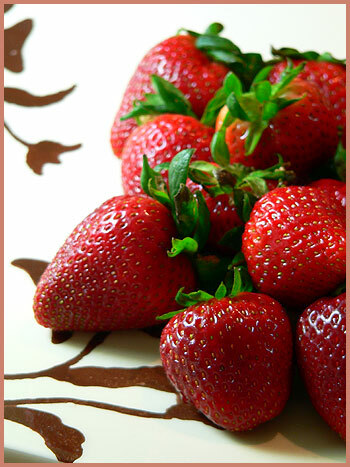 A simple photo of strawberries can be breathtaking and mouth watering! This is it. bring on the strawberries, bea! what a beautiful tower of berries in the next post 🙂 on a recent trip back to my parents home, i was surprised to discover my little strawberry plant had taken over a piece of dirt the pot was left on and now there’s a whole patch of tiny berries. When i picked them, I ate as I went and the scent was just intoxicating. There was enough for me, the quail who roam the yard, snails, and even the dog. Who knew dogs loved strawberries?